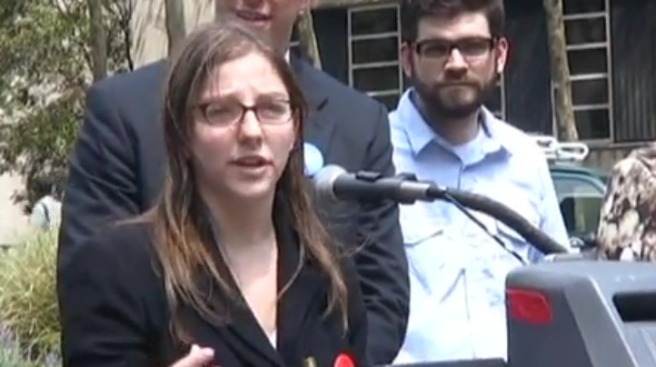 Hope Reichbach, shown here at a 2010 campaign event, was found dead at her Brooklyn apartment Thursday. She worked as an aide to Councilman Steve Levin and was the daughter of a judge. A 22-year-old aide to a Brooklyn city councilman found dead inside her apartment on Thursday had pills on a nearby table, Police Commissioner Ray Kelly said Friday. Hope Reichbach, who worked for Councilman Steve Levin and was also the daughter of Judge Gustin Reichbach, was found dead at her Schermerhorn Street apartment Thursday evening. Kelly said she was found face down in her bedroom. Sources tell NBC New York they suspect she overdosed; it is not clear whether it was intentional or an accident. Police don't suspect foul play. There was no note, Kelly said. Autopsy results will take at least two weeks. Reichbach, who grew up in Boerum Hill and attended Hunter College High School, was a rising star in local politics who ran for district leader last year. She wrote on her former campaign website about wanting to unite her generation and help build a stronger Democratic party in Brooklyn. Levin and Council Speaker Christine Quinn said in a joint statement that she was a "wonderful, vivacious and tough young woman." "We are deeply saddened by her passing and will miss her more than words can ever describe," she said. In a campaign video where local leaders endorsed Reichbach, community organizer Betty Lester praised the young woman's dedication. "She has a passion to improve the quality of her district," Lester said.